It is numbered 1/99. Nice AUTO card and hard to find. Check scan for detail. Spots are from scanner. Great addition for the DEKKER fan. Player: Sam Dekker. Year: 2015. Set: 2015-16 Panini Clear Vision. Manufacturer: Panini Group. Item#: 114. Attributes: Rookie. If the title & the picture do not match. If the card is serial numbered, it may no longer match the one pictured, as we have literally millions of cards. 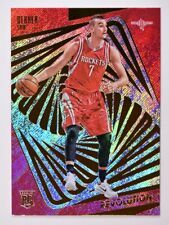 2015-16 15-16 PANINI PRIZM SAM DEKKER ROOKIE RC #339!!!!!!!!! ANYTHING ABOVE 10 CARDS WILL BE CALCULATED. Baton Rouge, La. 70816. 5734-A S Sherwood Forest Blvd. TIGER BAIT SPORTS. Sam Dekker Panini Gold Standard Rookie Triple Patch Autographed Card /25! 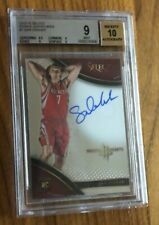 Here is a Sam Dekker Triple Patch Autograph Rookie Card Numbered 2/25!! This is from the 2015-16 Panini Gold Standard set! Great condition! A must have for any Wisconsin Badgers, Houston Rockets or Los Angeles Clippers fan!! 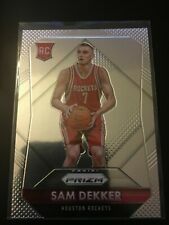 Player - Sam Dekker. Player: Sam Dekker. Team - Houston Rockets. Team: Houston Rockets. Manufacturer - Panini. Card Number - 118. Card Manufacturer: Panini. Card Number: 118. Beautiful basketball card! All cards are nrmt condition or better unless otherwise noted. THIS IS A 2015-16 PANINI GOLD STANDARD SAM DEKKER DUAL JERSEY AUTO CARD NUMBER 127 OF 149 MADE ! #180 Serial #106/199 Chinanu Onuaku. 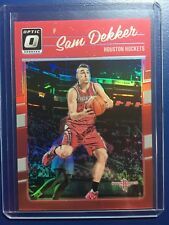 #113 Serial #006/199 Sam Dekker. #114 Serial #134/199 Patrick Beverley. From 2016-17 Optic Basketball Box. 2015 Panini Collegiate WISCONSIN Series. Player: Sam Dekker. Team: Houston Rockets. 2015-16 Panini Basketball Cards. Manufacturer - Panini. Set - Rookies. Card Manufacturer: Rookies. Trading cards only. 100,000's of cards. Los Angeles Clippers SP. all cards are nrmt condition or better unless otherwise noted. Sleeves or Toploaders may have sharpie, stickers, or tape on them. Card is NRMT-MINT. Beautiful basketball card! serial #3/49. All cards are nrmt condition or better unless otherwise noted. #111 Trevar Ariza. #112 Cint Capela. #113 Sam Dekker. From 2016-17 Optic Basketball Box.